Countless Lives had become stars due to the great earthquake. It is picking it up while saying that children are just part of the collection and the owners of whom the hands and feet were disjointed because of the tsunami will never understand. It is picking them up in tiles and pebbles now, for a lot of stardust that did not cut are covered with mud, and their light has only been shot so slightly. The mother earth, please be silent. Only in appearance in the stage, Yuko has a sense of existence that changes air. As for the work that she makes, there is a humour, too and are a lot of fans. Moreover, power and the charm in which her person is drawn in appear in not only the work but also the process of the workshop and choreography. It is very few dance people in the young man who succeed the method of Hijikata that acquires it from Yukio Waguri. Recently, an overseas university and the high school teach it. It studies under Yukio Waguri who is the apprentice of Tatsumi Hijikata at latter term at 1991. It takes an active part by [Yukio waguri +Kozensha]as the main dancer until 1998. 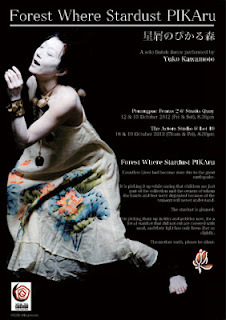 Established her Dance group [Shinonome Butoh] in 2000.